Feline Hyperthyroidism, overactive thyroid glands, is a common condition among cats, particularly those eight years old or older. The number of cases of hyperthyroidism in cats has been on the rise over the last few years and the exact cause is not known. Some researchers believe the problem lies in the level of iodine in some or most commercial cat foods. Others believe we are simply now detecting a disease that has always been common. A third possibility is that more cases are showing up because our cats are living longer due to advancements in technology. Whatever the case may be, hyperthyroidism is common and is a condition that all owners should be well aware of. Cats have two thyroid glands in their necks which secrete thyroid hormone. This substance is involved in many different processes in the body and is essential to life. However, sometimes we see cat thyroid problems, when too much thyroid hormone is secreted by these glands, it can lead to severe symptoms, even death. Knowing the signs of hyperthyroidism in cats and treating the cat thyroid problems can lead to a normal lifespan for your kitty. A hyperthyroid cat may not have all of these symptoms. While these symptoms can be due to cat thyroid problems, they can also be due to other conditions such as Diabetes for example. Also, any one or even a combination of these symptoms can indicate other conditions. That is why it is so important to see your veterinarian right away and get a proper diagnosis. Diagnosing hyperthyroidism in cats starts with a physical exam. It is very difficult, if not impossible, to feel the thyroid glands of a healthy cat. Conversely, it is easy to feel an enlarged thyroid gland in the neck of a hyperthyroid cat. That discovery along with a fast heart rate, high blood pressure and weight loss makes a veterinarian very suspicious of feline hyperthyroidism. The history you give your veterinarian can also make cat thyroid problems seem likely or unlikely. If your cat has any of the symptoms listed under the section above, he could be a hyperthyroid cat. If he has multiple symptoms, it becomes even more likely. If the physical exam and history are suspicious for feline hyperthyroidism, a blood test will be run (called a T-4 blood test). If it comes back normal, a different blood test called an Equilibrium Dialysis Free T-4 test can be run. This test can reveal a hyperthyroid cat that tested normally on the initial T-4 test. If both tests are normal, but your veterinarian is still suspicious of hyperthyroidism, there is a third test that may detect feline hyperthyroidism. It is called the T-3 suppression test. There are some cats that do not test positive on any of the previous tests, but are hyperthyroid. A technetium scan may be required to identify these cats. An injection of technetium is given and an image taken to see where the material goes in the body. When an abundance of the material is seen in the thyroid gland(s), this indicates hyperthyroidism. There is an inverse relationship between elevated thyroid levels due to hyperthyroidism in cats and levels of creatinine in the blood (the most important enzyme we can measure to determine kidney function.) 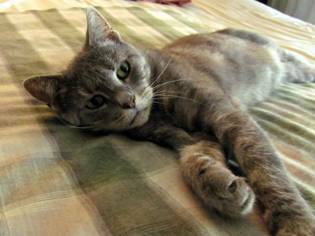 As the thyroid level goes up, as in feline hyperthyroidism, creatinine most often goes down. As we control the thyroid level and get it back to normal, the creatinine may increase, unveiling a formerly masked kidney problem. For this reason, it is essential that every time the thyroid level is checked, the creatinine must be measured as well. A hyperthyroid cat may have to take less thyroid medication than needed to regulate their thyroid levels in order to keep the kidneys functioning. When that happens, your cat will probably need heart medication to control the symptoms of high blood pressure and heart rate. Even though your cat may continue to lose weight in spite of a ravenous appetite, he can live much longer if heart rate and blood pressure are controlled and the kidneys are kept functioning well. You can read more about Kidney Disease here. There are three treatment options for any cat diagnosed with feline hyperthyroidism, each with their own benefits and risks. Your veterinarian will assist you in making the best decision for your cat’s treatment, but your options will consist of radioactive iodine therapy, medication, and/or surgery. Diet modifications may also be suggested. 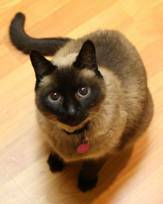 This is considered the gold standard for treating hyperthyroidism in cats. 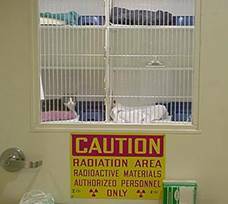 It is a safe procedure that is used for both people and animals, but requires that radioactive substances be handled, so it must take place at a veterinary center designed specifically for that purpose. Radioactive iodine treatment involves your hyperthyroid cat receiving one injection of radioactive Iodine-131. In rare cases, two injections are needed. When iodine is injected into the body, it goes to the thyroid glands and destroys the abnormal cells that are secreting extra thyroid hormone. Rarely does a cat need any additional treatment although an extremely small number of cats require thyroid supplementation after the procedure. The benefits of this type of treatment for cat thyroid problems are significant. Thyroid tumors are eradicated permanently. Serious side effects are not a concern, there is no pain involved, and your kitty does not have to be anesthetized. Healthy thyroid tissue is not destroyed nor are the parathyroid glands. Some cats have thyroid tissue in abnormal locations in their bodies which will also be eliminated by this method. Thyroid hormone levels usually become normal within a month after treatment. In most cases, cats no longer need medication. The only disadvantage is that this treatment for hyperthyroidism in cats requires that your kitty be kept in the hospital for several days until he is no longer emitting radiation from his body. For the first two weeks back home, your kitty needs to be indoors, the litter box has to be handled in a special way, excessive holding is discouraged, and hand washing is encouraged. Pregnant women are advised to not take part in the cat's care during that time. There are medications that do not cure hyperthyroidism in cats, but control the thyroid hormone level. These medications must be given in the form of pills, oral liquid, or transdermal cream. Periodic blood tests are needed to monitor the thyroid hormone levels and adjust the dosage as needed. There are possible side effects, some of which can be serious. You can read more about giving medications to pets here. One or both thyroid glands can be removed surgically if the veterinarian is experienced in this particular surgery. The disadvantages to this potential treatment for hyperthyroidism in cats include the risk of damage or accidentally removing the parathyroid glands, the possibility of leaving abnormal thyroid tissue behind, and the need for anesthesia. If the entire thyroid tumor, both glands, and any tissue elsewhere in the body are not removed, many cats end up needing radioactive iodine treatment for feline hyperthyroidism. The production of thyroid hormone requires iodine, which is obtained through your cat's diet. Some studies have suggested that too little iodine causes hypothyroidism (usually a dog thyroid problem) while too much can lead to hyperthyroidism (cat thyroid problems). 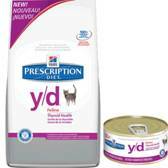 Based on those findings, a prescription diet has been manufactured by Hill's called Y/D, which severely limits the amount of iodine taken in by your cat. It is problematic to feed this diet in a multi-cat household because the cats without a thyroid condition should not eat it. The usage of this diet is also somewhat controversial among veterinarians. There is concern about the effects of a prolonged period of iodine restriction and the diet has not been around long enough to fully know these effects.